Matchmaking speed improved for the highest/lowest ranked players -> Example: If your search range is 200 and the best player is 50 rank higher than you then we shift the range to the left so you search 350 left and 50 right instead of 200 left and 200 right. Music is now automatically muted when out of focus. Replays now also store custom room settings such as pickups so those should work now. Improved replay loading so it’s not stuck at infinite loading and display a proper error message instead. You can now change (quality/audio) settings when watching replays - The default quality is still high but it can be changed, not all settings will have an effect! The settings are not saved because replays are in offline mode without any server connections. Orange pickups now activate after 1s (was 1.5). All pickups have been increased in size by 25%. Pickup spawn times have been increased and are now based on field-size. Start pickups now always spawn in the centre to give everyone a fair chance. Added an information message for new users when trying to use a power when there are no powers installed. Fixed an issue where music would not start playing during replays. 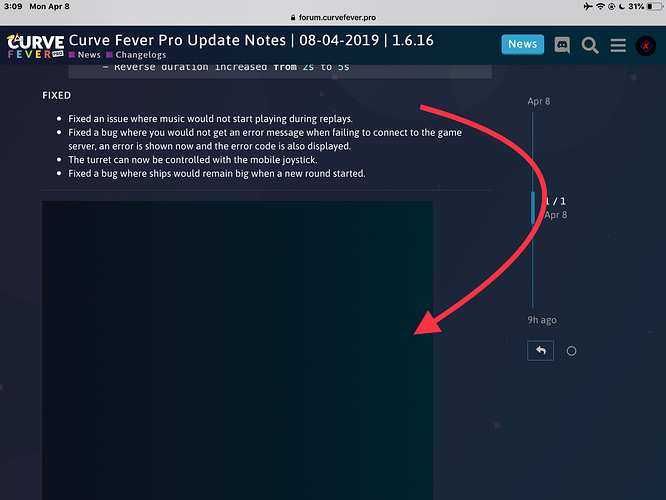 Fixed a bug where you would not get an error message when failing to connect to the game server, an error is shown now and the error code is also displayed. The turret can now be controlled with the mobile joystick. Fixed a bug where ships would remain big when a new round started. What is this? It’s just a black box , not mobile friendly? Yea on mobile these kind of things seem to be pretty bugged. The black box would show the patch notes for the update. It’s basically the same thing as what is above the “black box” but looks like the in-game version of the changelogs.